Born in Kolkatta, and raised in Delhi ,Mathangi is an only child to her parents who are both in Business. Having completed her schooling in Delhi, she moved to the garden city of Bangalore with her parents and completed her graduation in Business Management there. Through the years she tutored under Mrs. Rama Ravi and later on under Mrs. Neela Ramagopal in Carnatic music. She also received the Government of India scholarship to further her training in classical vocal music in her teen years. After her graduation she moved to Chennai and began her corporate career and over the next three years worked in the field of sales and advertising. It was while pursuing her Advertising career in a leading Multi National agency, that she got an opportunity to sing her first solo song anju mani for music director Deva, in the movie CHOCKLET. She also got to sing a diametrically opposite song kokkaragiri giri in the same film. After Chocklet she sang for Deva in many of his forthcoming films such as RED,123 etc. Over the last three years she has had the privilege of singing for Maestro Illayaraja in the films Ivvan & Devan, his songs Karthik Raja and Yuvan Shankar Raja in Bala , Popcorn, Perazhagan and 7/G Rainbow colony, Dhina -King, D.Imman In Tamizhan,Whistle Ramesh Vinayakam University,azhagiyae theeyae, Bharadwaj in the movie I love you da, the Deva brothers Sabesh and Murali Aairam poi solli, Vidyasagar in Alai and varnajalam, S.A.Rajkumar and many more, in all the four southern languages. She has also sung many jingles in all four southern languages. She has recently also sung for musical Isai Puyal A R Rehman in his films Kangalaal Kaidhu sey , Parasuram , Enakku iruvadhu unakku padhinettu, Tehzeeb- Hindi. 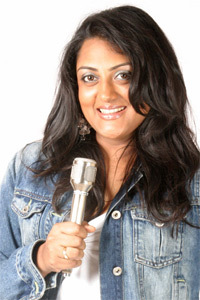 She has also sung in the Hindi Remix album Club Hits by Mr. Leslie Lewis of Colonial Cousins fame . She has recently completed her Masters Degree in Communication, and now juggles between her newly commenced Hindustani music lessons under guru Smt.Meghna Dandekar her Carnatic music lessons under Guru Smt.Suguna Purushottaman, voice training in western music under Mr. Jabez Jaganraj and recordings and stage shows.